OK, it’s been a week, it’s high time I reflect on last TotalCon. I think I can honestly say: best con ever. And I really wasn’t expecting that. If anything I really threw this con together last minute: I fell backwards into a room with a friend that needed a roommate, the games I ran were a collection of games I’ve run at other cons because I was too busy to write any new material, and by the time we arrived I had completely forgotten everything I had signed up to play. I was even surprised when opening my envelope of tickets to discover I had pre-paid for a t-shirt. Wow, it was like a nice little present from my past self. Thanks Paul of the Past! My games ran pretty well. Actually, oddly my Thursday evening game for which I expected low turnout, and planned an adventure that was easy to scale, had 8 people show up. Friday afternoon, on the other hand, I had to cancel because only 2 showed up. The last game I ran on Saturday afternoon had an almost completely full table of 9 players. The lesson is there’s really no good way to predict how many players you get, and you just have to be ready to roll with the punches. Thankfully on Friday Tim was running a continuation of a game I played in a previous year, and he was gracious enough to let me join his over-full table. 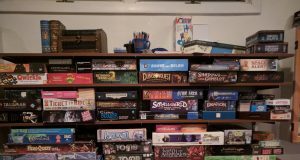 It’s a funny connection – my TotalCon roommate is an old friend from college and happens to now live in the same town as I do. He goes to TotalCon for the board games, I go for the RPGs, so besides the occasional meal together and chat in the evening, we don’t really see much of each other at the convention. Lara, the first person he introduced me to, was an ex-coworker. It just happens that he was connected in these random ways with two people who are both RPG nuts and have been going to TotalCon for years. And so Lara introduced me to her sister, and her sister’s husband, and they being gregarious people introduced me to a whole ton of other people I had never met before. I was invited to join them at the hotel bar after the games Friday night, which was full of good humor and great conversation. I went there again Saturday, at which point I found myself being led through the halls from one party to another. Who knew there were after-hours parties at TotalCon? Well, I would if I thought about it. A couple years ago I posted about the insanely loud people in the next room. Was this them? Maybe. I get the impression there are plenty of other late night parties at this thing. I mentioned this anecdote of my loud neighbors at one of the parties, and got the very apropos response “well, if you can’t beat ’em, join ’em!” And why not? I already learned the lesson of “don’t play 8 AM games”. In fact, I scheduled nothing earlier than 10 AM, and honestly, if I missed one of those it wouldn’t be the end of the world. So I stayed up late, had a few too many beers, and generally just had an awesome time. Being at a party full of gamers you don’t know is a very interesting experience too. It’s like a normal party full of people you don’t know, only there’s this wonderful implicit topic of conversation. I never felt awkward talking to a single person — they all had very interesting things to say, and were interested in what I had to say. It was almost surreal. Anyway, I’m really looking forward to going back, and it seems my new friends are now trying to recruit me into GMing games at Carnage on the Mountain, a convention in November up in VT. It’s not taking very much arm twisting at all.